In case you hadn’t heard, the drought in Northern California is in the midst one of the worst the state has ever seen. With so little water, and much of it being understandably prioritized for drinking and agriculture, many of the lakes and pools typically used for swimming are dry. This is especially true in the South Bay and down in the Central Valley, where giant lakes have turned into dry meadows. But, fear not: here are some great places to cool off and enjoy some splashing around this summer. Out in Livermore, Del Valle Regional Park is part of the extensive (and wildly popular) string of parks, trails, and lakes that make up the East Bay Regional Parks . In the middle of 4,300 acres, Lake Del Valle is the crown jewel of Del Valle park. There are two swim beaches – one on the west shore and one on the east shore – with lifeguards in the summer and picnic tables. You can also launch boats for a fee. The park gate is open from 6 a.m. to 9 p.m. through Labor Day and costs $6/car. (Check current water conditions before you go). And, you’ll definitely want to go before Labor Day. 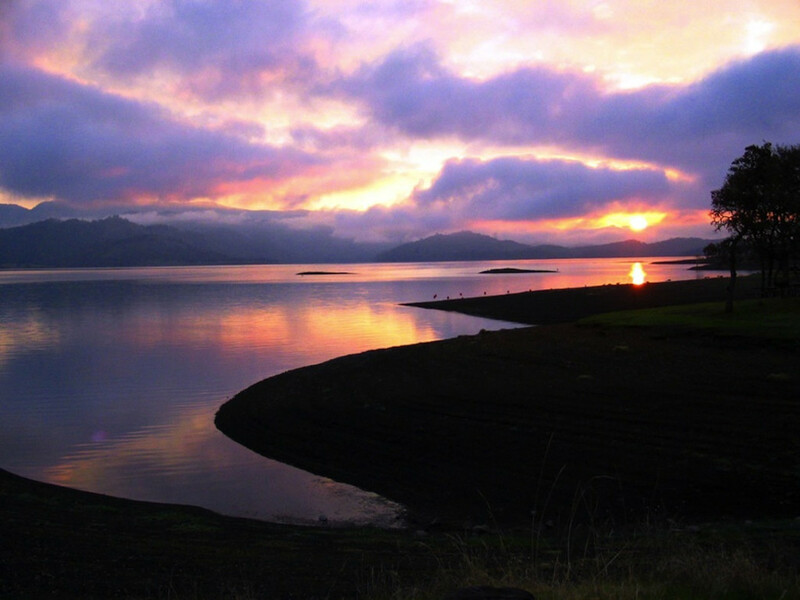 Lake Del Valle receives most of its water from the state and then supplies water for drinking to a number of local water agencies. While the lake was filled to capacity in May, it will be drawn down to satisfy water needs starting in July. According to park officials, the plan is to keep the park (and lake) operating through Labor Day – but swimming will become noticeably affected later in the summer. If you make the drive out to Napa, take a break from wine tasting to visit the county’s biggest lake. Lake Berryessa was formed by Monticello Dam in the 1950s. Today, it’s also an incredibly popular spot for recreation, cooling off, and local swim races and triathlons. Most of the concession areas, boat launches, and the visitor’s center are along the west side of the lake, off of Highway 128. The area is operated by the Bureau of Reclamation, which updates conditions regularly on its website . Water levels are low, but the lake is still open for swimming – for now. Check the Lake Berryessa News facebook page for the latest information. 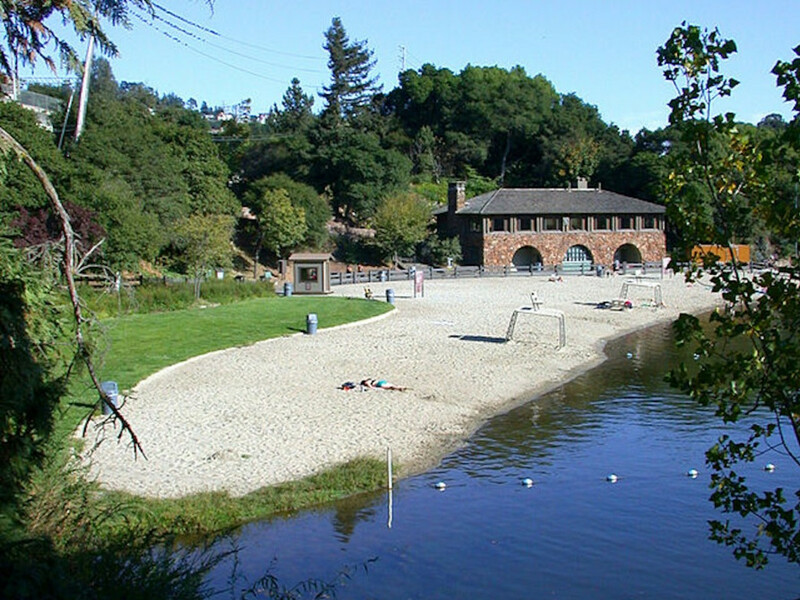 Right in the heart of Oakland, Lake Temescal is a convenient spot for a quick get-away. Run by the East Bay Regional Parks, the lake has lifeguards on duty in the summer, picnic tables, and access to a local trail network. With historic facilities built in the 1940s, it’s also a popular spot for weddings – so watch out for flying bouquets. The park gate is open 8 am-10 pm and there is a $5 parking fee, as well as a beach access fee of $3 for adults and $2 for kids and seniors. Swimming at the designated beaches is available through August, though water levels may go down later in the summer. (No dogs are allowed at the beaches.) Check the water conditions before you go. 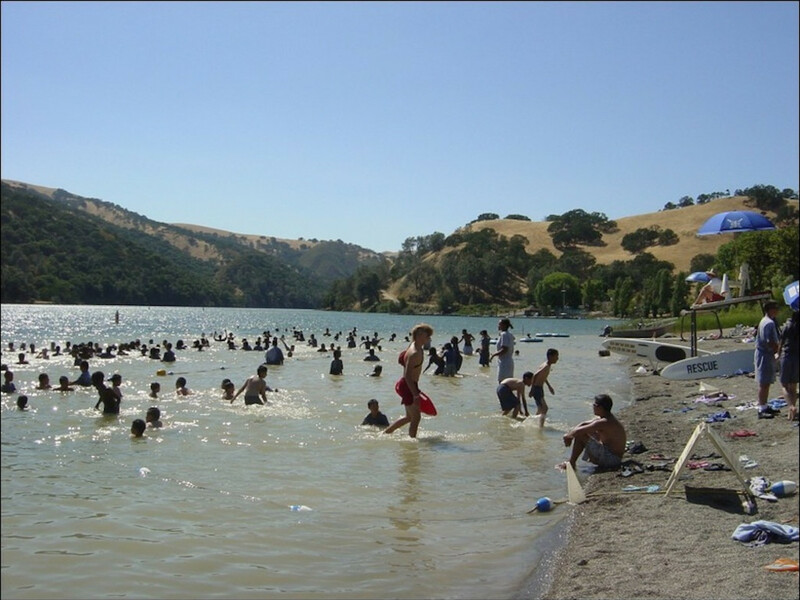 Hidden outside Bolinas, Bass Lake is the only lake in Marin County that allows swimming. The down (and up) side: you’ll have worked up a sweat by the time you get there. From the Palomarin Trailhead, at the end of Mesa Road, it’s a moderate hike up the Coast Trail to the lake. Most people will tell you it’s just under three miles to the lake, but expect it not to be a quick three miles. You’ll see the lake before you reach it. And, there’s no sandy beach or lifeguards. Swim and scuttle down the dirt bank, watching for poison oak, at your own risk. But, once you’re in the water, it’s a clear, fresh, quiet lake surrounded by trees and hills. Plus, there’s a rope swing, if you’re feeling particularly adventurous. To get to the trailhead, turn off Highway 1 into Bolinas, take Mesa Road out of town, past the bird observatory, until it turns into a dirt road and dead-ends into a parking lot. Ideal for kids, Parkside Aquatic Park is a unique experience. It’s swimming in the Bay, but not really in the Bay. Parkside is actually part of the Marina Lagoon, meaning it’s got sandy beaches and no waves. The free city park also has a boat launch ramp, picnic tables, and a playground for kids. Run by the city of San Mateo , the park sits just off a residential neighborhood between Foster City and San Mateo – right next to Seal Slough. Swim within the buoys, as the lagoon is used for boating. And, with water quality sometimes being questionable at that end of the Bay, you’ll want to check the water quality conditions before jumping. Scared of swimming in the Bay? 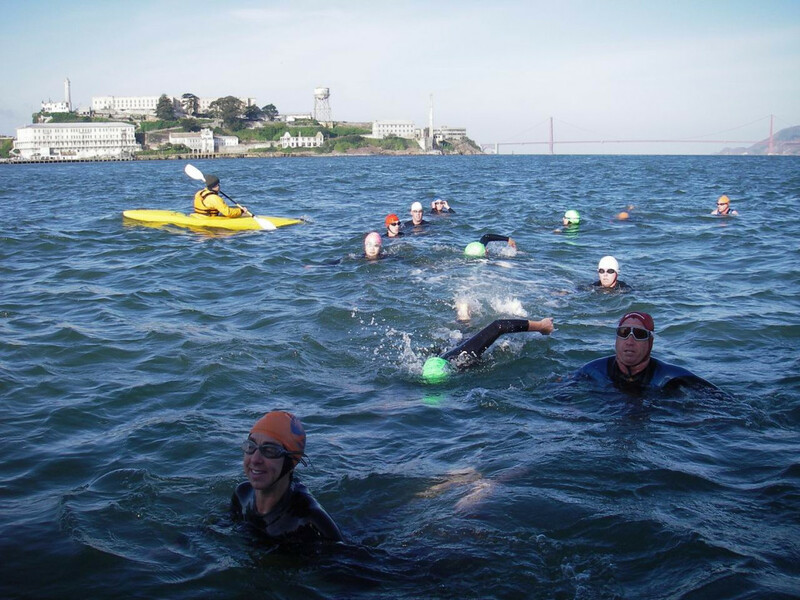 Fortunately, RootsRated already has some tips for you on open water swimming in the Bay . 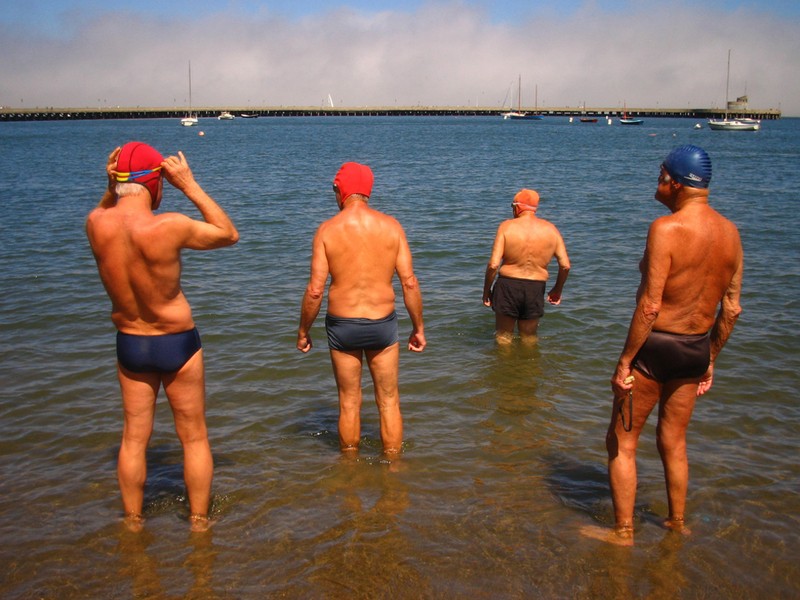 If you really want to swim laps, head to Aquatic Park or swim off the beach at Crissy Field . Both are free – though parking can be a nightmare on warm weekends. Just be careful. The water is typically in the high-50s in the summer; there is wildlife; and current or wave conditions can be challenging and dangerous. Swim with a buddy. If you’re looking for more of a casual, lounging environment, then head to Crown Beach in Alameda. Just off the Bay Trail, the beach has a bird and animal sanctuary at its east end. Swimming (away from the protected wildlife) is permitted year-round. The water is slightly warmer than the rest of the bay, because of the protected cove. There are no lifeguards on duty. 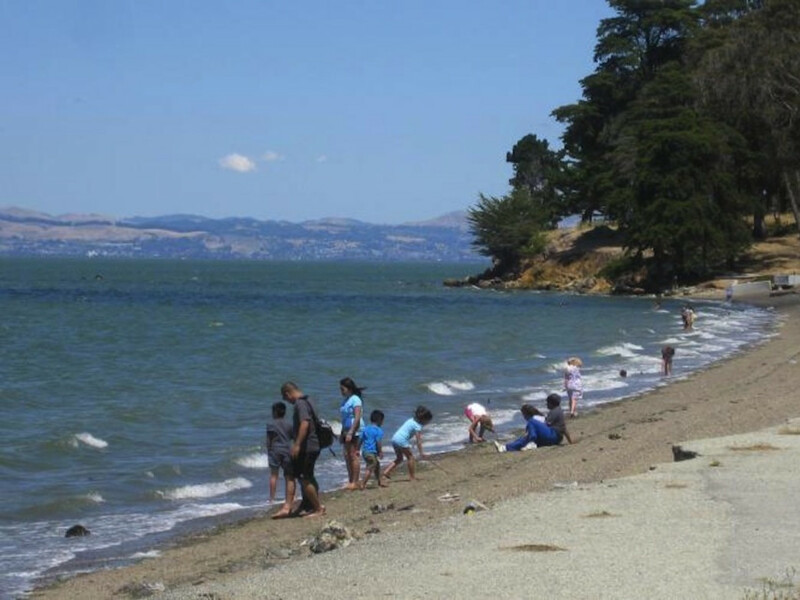 In the South Bay, Coyote Point Recreation Area is much beloved. Launch a boat, windsurf, or dip into the waves – but know that there may be bigger waves than you were hoping for. Of course, instead of heading into the protected bay, you could also just swim in that great big expanse of water all around us. It hasn’t been affected by the drought – yet. Know that Northern California beaches on the Pacific Ocean, though, are not the warm, calm, sunny beaches you might be thinking of. Typically, beaches here are cold, rocky, and have extreme rip tides. In San Francisco, swim at the popular Baker Beach , just watch out for naked sunbathers, or dip in the water at the nearby and slightly less-crowded China Beach . Ocean Beach is a favorite local spot for extremely challenging surfing and late-night bonfires. But, make sure you follow the recently updated fire rules . 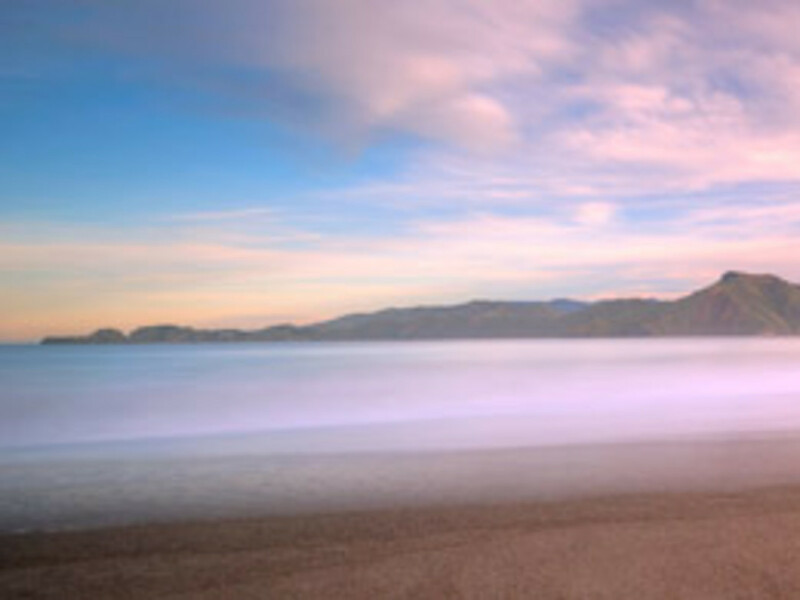 In Marin County, head to Stinson Beach for the typical white sandy beach. Just know that every tourist in the Bay Area is probably headed there too. Or, go around Highway 1 to Bolinas for some beginner-friendly surfing.